Dmitriy Butakov has become the first ever two-time Magic Online Champion, crushing the competition all weekend with Bogles and winning $40,000 for his hard work! Follow live streaming video coverage of the 2017 Magic Online Championship on twitch.tv/magic! The hashtag for the 2017 Magic Online Championship is #MTGOChamp. Join the conversation. 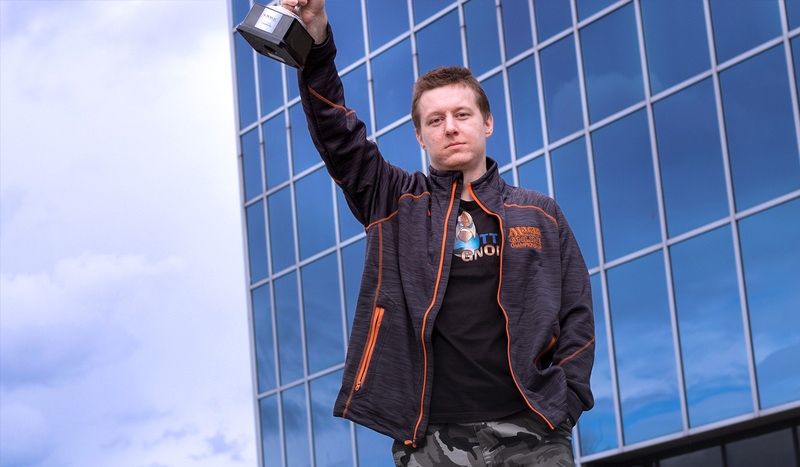 Dmitriy Butakov won the Magic Online Championship five years ago in Chicago, making his name known amongst the competitive Magic community after many years of dedication to playing on Magic Online. This year, he cements his legacy, becoming the first ever two-time Magic Online Champion. Butakov made quick work of nearly every opponent he faced all weekend, putting up respectable finishes in both Booster Drafts but—more importantly—crushing the competition with his Modern deck choice. In a field with Jund as the top choice of many players, Butakov’s pick of Bogles despite not generally playing the archetype gave him win after win in the Constructed portion of this tournament. Although Butakov was more known for playing with cards like Gifts Ungiven, he demonstrated his playing prowess by piloting the archetype flawless across all three days. The winning didn’t stop after the Top 4. His semifinals against Lars Dam in a battle between Magic Online Championship winners of years past featured four games and less than ten minutes of gameplay, with Butakov’s deck choice showcasing the strong metagame call. It was in the finals against Steve Rubin where Butakov’s winning streak took a hit, with the Jund player taking a match in a best two-out-of-three-matches finals. However, Butakov persisted, winning the first game of the second match in under fifteen seconds, and he didn’t slow down. His perfect, incredibly fast play secured him the wins he needed to be crowned the 2017-18 Magic Online Champion. This win goes beyond the $40,000 that Butakov earned, along with the invitation to next year’s event and status in the Pro Tour Players Club to return to the Pro Tour. For Butakov, it makes him the game’s first ever two-time Magic Online Championship winner. The legacy of his finish will last a lifetime. Butakov reminded everyone this weekend why he one of the most respected and accomplished players on Magic Online, and nobody will ever take that away. The Top 4 of the Magic Online Championship is set, featuring Steve Rubin, Niklas Dahlquist, and former Magic Online Champions Dmitriy Butakov and Lars Dam as they compete for a second title! Tune in Sunday at 10 a.m. PT/1 p.m. ET/6 p.m. UTC to see which of these four competitors will win the $40,000 first place prize and the title of 2017-18 Magic Online Champion! After seven rounds of Swiss, Steve Rubin is the sole player remaining at 6-1. Come back Saturday to twitch.tv/magic starting at 10 a.m. PT/1 p.m. ET/6 p.m. UTC to see whether he will keep his lead, as we have another seven rounds of Swiss remaining before our cut to the Top 4 players!